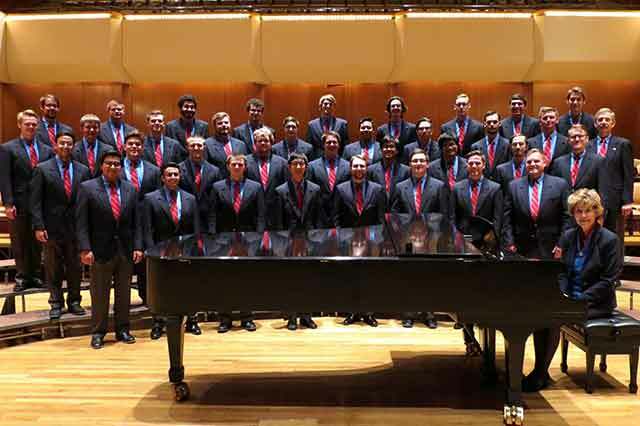 The Wabash College Glee Club will present its Campus Concert at 4 p.m., Sunday, April 10, in Salter Concert Hall in the Fine Arts Center. The men of the Glee Club recently returned from their 2016 Tennessee Tour that featured performances in Nashville and Memphis, including a Sunday morning service at St. Augustine’s Episcopal Church on the Vanderbilt University campus; concerts at several retirement communities; a joint performance with the Marion, Arkansas High School Chorus; as well as receptions and singing for the Nashville and Memphis Associations of Wabash Men. This year’s Tour group also spent an entire day at Ocean Way Studios in Nashville—a rare opportunity to experience the musical rigors of performing multiple “takes” in a professional recording studio. Highlights of Sunday’s program include several “robust” men’s chorus selections, including Hark, I Hear the Harps Eternal and Brothers, Sing On; an amorous English madrigal with a modern twist, Fair Phyllis I Saw; two folk songs from “across the pond, ”The Maid of Llanwellyn and Loch Lomond; and a couple of chord-bending barbershop numbers, Goodbye, World, Goodbye and Yes Indeed! Performing on two keyboards, the “Tennessee Four” will present Cheryl Everett’s arrangement of The Grand Piano Band, premiered during the 2016 tour. Performers and audience alike will enjoy the opportunity to view Dr. John Zimmerman’s Tennessee Tour video highlights. Finally, the Glee Club will thank Tom Runge, recently retired as Director of Alumni and Parent Relations, for his many years of energetic support of the Glee Club. The Glee Club is under the direction of Dr. Richard Bowen and is accompanied by Ms. Cheryl Everett. The concert is free and open to the public. A reception in Littell Lobby will follow the concert.